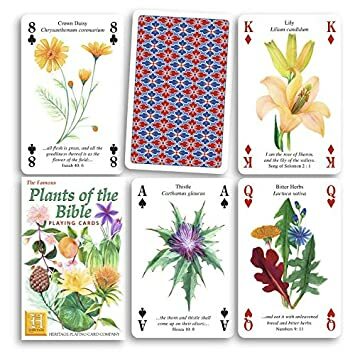 These are flowers on the card side where the numbers/suites are...the only thing is that these flowers are i suppose famous in the bible. So I am not sure if that will conflict with your religious/spiritual standing. You could probably find them on the Amazon in the UK. They also have trees, shakespeare flowers, famous roses. not really sure what you mean by number have to be in the same place as a regular deck because this is what a poker deck looks like at least in the united states. If you are looking for a deck that only has numbers on it that can't be revered. Then I would write reversed on the bottom part of the card and when you pull it will show if it's reversed or not once turned over to look at the number/suite side. Well hope you find what you are looking for. Best of luck. Maybe it's this one, by Olga Begak who made the gorgeous Snake cards? Thanks for the info. Nemia, interesting cards, but alas not what I am looking for. Are you looking for flowers in place of pips? I haven't seen any like that, but it does sound intriguing. I found this one - but it's not a playing card deck and it isn't complete but I thought it interesting. There are lots of novelty tarot decks around but not many novelty playing cards with altered pips.